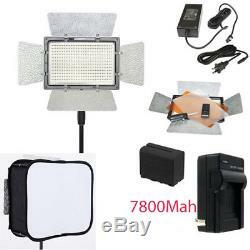 YONGNUO YN900 LED Video Light 3200k 5500K PRO KIT W TWO Battery Softbox Charger AC adapter. YONGNUO YN-900 YN900 LED Video Light 3200k 5500K Camcorder camera wireless remote and two batteries. 1>YN900 is equipped with multi channel wireless remote controller which is used to adjust the luminous intensity and control the switch of YN900. It is very convenient to use this controller to control the luminous intensity and the switches of 8 groups of video lights. 2> A mobile APP is provided on our official website. You can control your LED video light as needed. 3> YN900 is equipped with a Type-D lamp holder which is very convenient for you to fasten and use YN900 on various kinds of flash bracket. 4> YN900 adopts 900 high quality LED lamp beads with chips of extra-large luminous area. In the same energy consumption, the luminous intensity is greater. The facular is more uniform and the service life is longer. 5> YN900 adopts YONGNUO proprietary LED driving technology which does great help to effectively avoid corrugation and stroboscopic flash. 6> YN900 adopts encoder digital dimming system, including coarse tuning mode and fine tuning mode. 7> On the LED digital display screen of YN900, the parameter of the power output is intuitional. 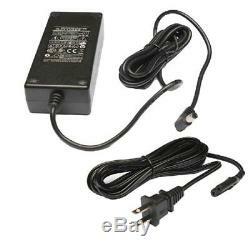 8> Shooting for long time is possible because YN900 supports external DC power input (power adapter is optional). 9> The fan forced heat dissipation YN900 adopts solves the heating problem after the long use of LED video light. 10> YN900, equipped with 2 pieces of color temperature filters, can be used under different circumstances. 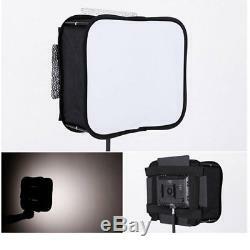 SB600 Softbox Diffuser for YONGNUO YN900, YN600 LED Video Light Panel Foldable Portable Soft Filter. 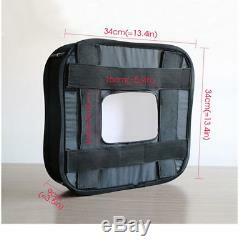 It is a compact collapsible softbox that can diffuse the light for a softer and natural look. 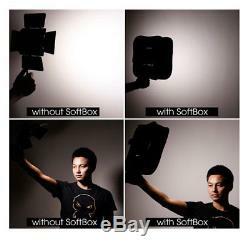 Simple to Fold and Carry: Open the softbox and attach it, via the attachment straps to soften the light. Lightweight and Durable: The Magnetic Locks will provide you with the ability to collapse the softbox down to a very compact size. 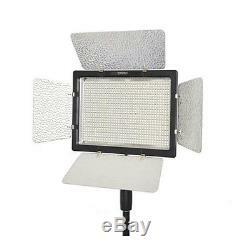 High Quality Materials: Softbox is constructed with the same of Professional Studio Softbox Meterial. 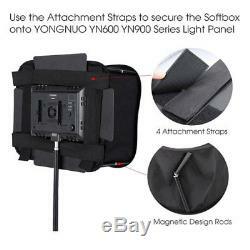 Special Designed for YONGNUO YN600L YN900 Series Light (SB300 for YN300 Series) or about the Same Size of YONGNUO YN600 Light Panels. 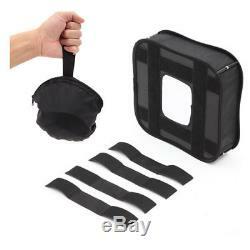 Carrying Pouch Included: Quick and easy to pack for any photo or video shoot. YONGNUO YN-900 YN900 LED Video Light 3200k 5500K Camcorder camera wireless remote. 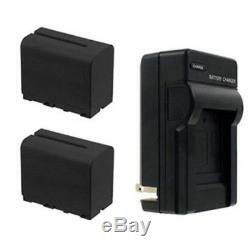 Two High Power NP-F975 Batteries & Charger , AC Adapter , Soft box , color filter , Handel. We DO NOT accept payments by cheque. SERVICE TRANSIT TIME is provided by the carrier and excludes weekends and holidays. Transit times may vary, particularly during the holiday season. 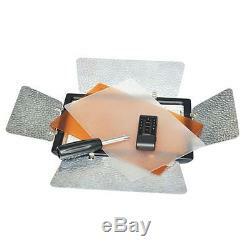 We will inform you if we need more time to prepare the items. As usual, it take 20 to 45 days to reach your designated address by HK Post. The item "YONGNUO YN900 LED Video Light 3200 5500K PRO KIT Battery Softbox Charger AC adap" is in sale since Friday, May 18, 2018. 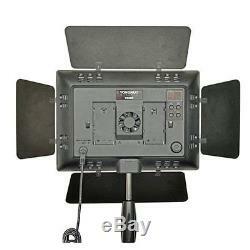 This item is in the category "Cameras & Photo\Camera & Photo Accessories\Camera & Camcorder Lights". The seller is "xianghuistoreonline" and is located in ShenZhen. This item can be shipped worldwide.